Christine Caine is an Australian born, Greek blooded, lover of Jesus, activist, best-selling author and international speaker. Her primary passion is to make Jesus’ last command her first priority by giving her all to see the lost saved and to build the local church – globally. Christine also has a passion for justice, and together with her husband, founded the anti-human trafficking organization, The A21 Campaign. In 2015, they also founded Propel Women, an organization designed to honor the calling of every woman, empower her to lead, equip her for success and develop a sense of God-given purpose. Powered by hot, extra-dry, skinny, cappuccinos, Christine is a lover of words who speaks too fast, talks too much, and also writes them down. Her most recent book is, Unashamed: Drop the Baggage, Pick Up Your Freedom, Fulfill Your Destiny. 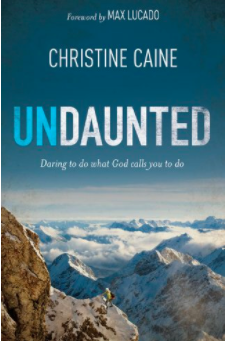 In the five-session video-based small group Bible study DVD, Undaunted, Christine Caine shares her compelling personal journey and offers insight into how anyone can overcome challenges and pain putting their trust in God. ▶ This DVD features five 10 – 15 minute live teaching sessions from Christine Caine. ▶ This DVD is designed for use with the Undaunted Participant Guide (sold separately). When used together, they provide a practical tool that can help strengthen your faith.